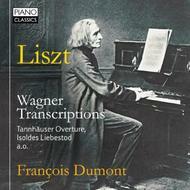 This new Liszt recording presents a generous selection of the transcriptions that Franz Liszt made of orchestral works by Wagner. Liszt, an ardent and devoted admirer of Wagner, supported him by performing his new operas in Weimar, and by making transcriptions to further popularise the music of his idol. Liszt, the pianistic wizard, transfers the orchestral sonorities to the piano, creating a new work of art, instead of a mere piano reduction of an orchestral score. The famous Tannh�user Overture doesn�t lose anything in grandeur and bombast on the piano, and Isolde�s Liebestod is an exquisite, moving pianistic masterwork on its own. Francois Dumont is one of the foremost pianist of the young French generation. As Laureate of the Warsaw Chopin competition he attracted international recognition. His recordings have won a Diapason d�Or and other prizes - his recording of the complete piano works by Ravel (Piano Classics PCLD0055) counts as one of the best to have appeared in recent years.